A UNT research team received $10 million from the Department of Energy toward research aimed at making the disposal of nuclear materials safer. The Energy Frontier Research Center, or EFRC, involves Jincheng Du, a materials science and engineering associate professor who has been a part of the project since it began in 2016. The collaborative effort is looking at nuclear waste degradation mechanisms, waste performance and the design of new waste-management methods. The collaboration is comprised of a team of 46 individuals. They are divided into three teams of study within the nuclear waste research; glass, ceramics and metals. Du will be working under John Vienna, with Joseph Ryan, Stephane Gin and Seong Kim. The teams will switch off as they find out more about the materials’ ability to cope with the waste in their model. Working together with all the different materials will allow them to find synergies they can work with to propose valid waste-management systems. After all the synergies are complete, the deputy director, Xiaolei Guo, will look at it and send it over to the center director, Gerald Frankel, for final approval. Much of the experiment Du is looking at will focus on glass corrosion and ways glass can be used in securing nuclear waste. As nuclear waste is held underground, it is often held in storage tanks, which are held in glass hosts before being disposed of. The glass corrodes very slowly. But part of the question is the rate at which it corrodes. If nuclear waste were to corrode enough it could eventually break through the tanks underground and go into the waterways. 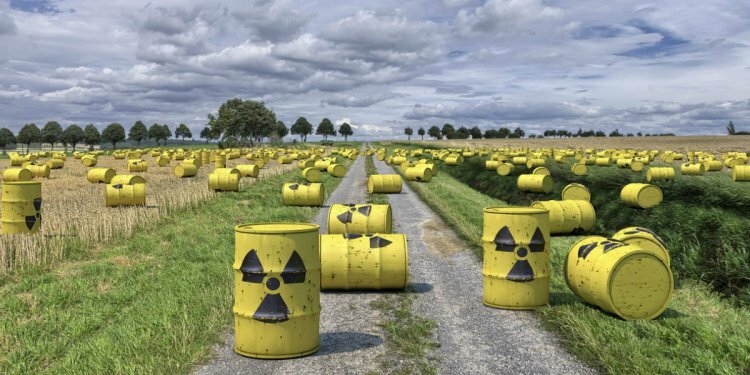 With nuclear energy comprising 20 percent of the United States’ energy supply, the dangers of badly-disposed-of nuclear waste are as relevant as ever. Nuclear energy is done through either pressured or boiling water reactors. Two-thirds of reactors in the United States are pressured and one-third are boiling, according to The Nuclear Energy Institute. In a boiling reactor, water heats nuclear fuel to create steam driving the generator to create the energy used for fuel. In pressured reactors, boiling is prevented by pressured water that goes to a reactor vessel by pipeline. The hot pipeline boils water in the steam generator for a brief second, making steam. The water vapor spins a turbine, creating energy used for fuel. Once the fuel – often uranium or plutonium – is used, it is considered spent and must be discarded accordingly, as radiation seepage could seriously harm humans. For the most part, disposal sites are isolated and waste is buried deep underground. It is the method of disposal that is in question for UNT researchers. More often than not, the waste materials are stored in glass. Through this project, Du said he hoped students could learn from researchers on the team and advance in their own profiles. The goal, Du said, is to promote students so they have better career opportunities after graduation. “If we can figure out how to properly dispose of these things we will have such an efficient resource, it’s crazy, ” communications junior Seth Van Velzor said. He added there need to be stricter regulations, referring to the Deepwater Horizon oil spill in the Gulf of Mexico in 2010, as well as the current battle around the Dakota Access Pipeline. He wants to make sure these materials are handled safely, for the environment’s sake. On a global level, Van Velzor said there’s a disparity in the way other countries protect their people from nuclear waste. Some countries have adequate protections in place. Others not so much. Van Velzor said the best way to get these countries to better dispose of their nuclear waste materials is to continue research and education on nuclear energy.